That does not mean you should stop playing sport, but just pay attention to your surroundings and the people around you. A nasal fracture can be disfiguring, but some people believe it gives your face character. However, on a more serious note, if not addressed a broken nose can lead to breathing difficulties. If you do suffer from a nasal fracture, whether it is through playing sport or not, you should visit an ENT specialist as soon as possible after the event for the best possible care. Head injury: The first thing to check is whether there has been a head injury as well as a blow to the face. Head injuries can be very serious and can cause more than a nasal fracture. They can cause concussion, neck injury, brain damage, etc. If that is the case, then the matter should be dealt with by the emergency medical services. Apply ice: if possible applying ice to the area will help reduce the swelling that will inevitably occur, if it hasn’t done already. 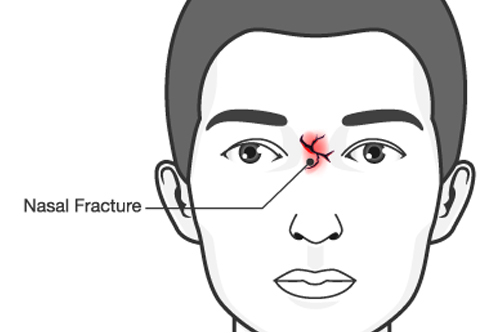 Inspect the area: When you have got over the shock, check your face for signs of a nasal break. This could show in the form of a misalignment of the nose, such as appearing crooked or asymmetrical. The nose could also have a flattened bridge, depending on where the break has occurred. Once initial checks have been completed, you should not take further part in the sport, but should visit a medical professional, such as an ENT specialist to check you over thoroughly. You could always visit a local hospital for assessment and X-rays to check the full extent of the bony injury. In any event, your face around the top of the nose and the eyes is likely to swell and bruising will emerge. Your nose needs to be properly assessed to ensure no bone has broken away and a hematoma is not forming. Your ENT specialist may also be able to reset the fracture if it is minor. If you do not seek immediate medical assistance, the way the bone repairs itself may not be correct and you may need surgery in the future. You should not play a physical sport for at least a couple of weeks following a simple nasal fracture. More complicated nasal injuries will require longer to hear. Your ENT specialist will advise you of the amount of time you need to heal.